I know what my all but non-existent Minnesota readership is thinking: finally, someone’s gotten around to reviewing this Twin Cities mainstay! But you should really curb that cruel sarcastic impulse and bear in mind that I did not have a blog till just over 18 months ago and only got around to reviewing restaurants regularly this summer. So, here it is, only seven years or so too late: your review of the food court at Hmongtown Marketplace. Any week now you can expect a detailed breakdown of a Jucy Lucy at Matt’s. I am embarrassed to say that despite having lived in the general area for more than seven years now I’ve not really made too much of an attempt to explore the Hmong food scene. In my defense this is largely because we happened very early on Hmongtown Marketplace in St. Paul and didn’t really feel the need to branch out. The Hmong are, by far, the largest Asian community in Minnesota (see data from the 2010 census here) and are a fairly visible minority in the Twin Cities, especially in St. Paul where there are a number of Hmong farmers’ markets among a larger number of Hmong businesses, especially along the University Avenue corridor. Hmong food, however, doesn’t have quite the visibility in the mainstream Twin Cities food scene of some other Asian cuisines with smaller supporting populations; no single establishment rises to the name-recognition/acclaim of, say, Quang (Vietnamese), On’s Kitchen (Thai), or Grand Szechuan. This may well be at least partly for economic reasons. As per the 2010 census data linked above, the per capita income for Minnesota’s Hmong population is $11,316. This is, by far, the lowest of the Asian populations measured, half that of the next lowest group (the Vietnamese) and less than a third of the highest (Indians). So while the population is large it may not be able to sustain restaurants above the very affordable category. Which is the category in which the food court at the Hmongtown Marketplace falls. Located at the intersection of Como and Marion in St. Paul, Hmongtown Marketplace is a large complex consisting of an outdoor farmers’ market and various large warehouse style buildings, some of which contain more produce vendors as well as purveyors of various other goods aimed at a predominantly Hmong clientele. You can get a lot of produce that you won’t see anywhere else (other than at other Hmong markets), and at very low prices; and you can also shop to your heart’s content for DVDs, clothes etc. One of the buildings, the first on the left as you walk from the chaotic parking lot towards the market, also houses a food court (in the back of the building past the random shops). There are six major food vendors there, most of whom, for the most part, serve overlapping menus, and two others that sell boba and other sweets. This food court is our primary port of call at the market, and so it was this past Saturday when we met some friends there for lunch. There were five adults, an 11 year old and our boys eating. Click on an image below to launch a slideshow with descriptions. The main outdoor farmers’ market area. It’s slim pickings in the late Fall in Minnesota but you can see some of the Asian eggplants etc. here as well as ridiculously cheap squashes. …of more than one species. 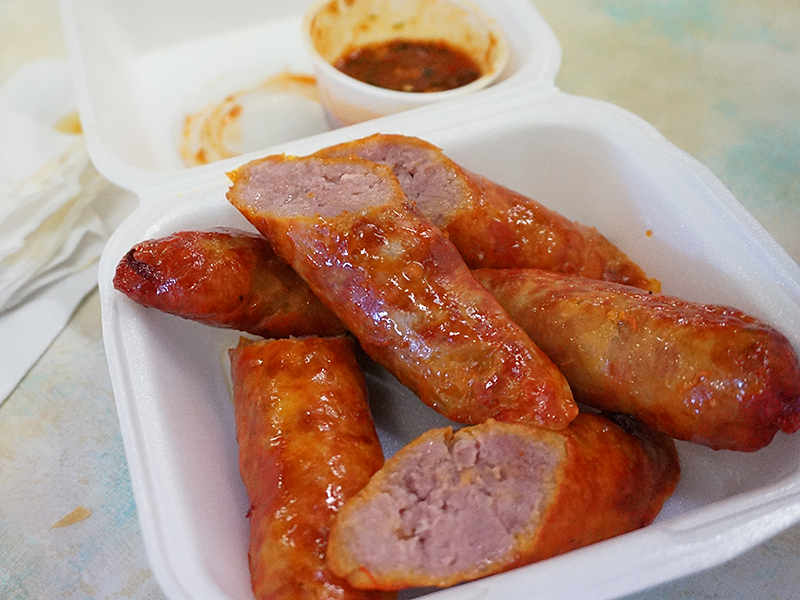 …and a long Hmong sausage. All of these things (and all their analogues at the other vendors) seem to incorporate red food colouring. At any rate, the redness is not from hot chilli powder. Where we got a large bowl of coconut curry soup. This was very good: rich without being cloying, with great big hunks of bamboo and bits of pork floating around in the soup. Perhaps our favourite of the meal. …for some papaya salad made to order. You can tell them to make it less or more spicy to your preference. It does take a while though as every salad is made from scratch. Here’s ours. It was a bit heavier on the fish sauce than I think most of our party would have preferred but I thought it was pretty damned good (and pretty damned lethal). We wanted another noodle soup and the only one they had on this day was their “pork noodle” soup; however, in practice this turned out to be pho/fawm. …and pour the broth over. Not bad, but the broth was a bit too sweet. For all I know, this may be the Hmong preference. They also had a few other things at the steam table, but since I liked the first taste they gave me a lot I just got that–it’s the green slop at top (pork and some sort of boiled sour green mashed together). It was very good. As was this braised pork belly in a sweet sauce from Chai’s Cooking. Pretty good fried rice, also from Nyob Zoo Kitchen. The chaotic dining area. Though it doesn’t look it in this picture it can be quite a scrum to get a table (especially on Sundays after church). As you can see, very little of what we ate (and even less of what we didn’t eat) qualifies as health food. It was all very good though. And also all very inexpensive. It’s the rare item that costs more than $6 and the portion sizes are all very generous. Bear in mind that it’s all cash-only; but don’t worry about language issues—every vendor has at least one person on hand who speaks enough English for clear ordering purposes and most of them often have younger people at hand with whom there’s no question of a language barrier. And they’re more than happy to explain and even give you tastes of things you’re not sure of. As noted in the captions, it can be a bit of a scrum to get a table, especially if you’re in a large group, and it’s generally not a bad idea to carry your own disposable paper plates and bowls if you want to share. So, if you haven’t been, go. We really should go more often ourselves (it had been a couple of years since our last visit). By the way, a few years ago another similar complex opened elsewhere in St. Paul (Hmong Village) but it’s further away still from us (it’s already about a 50 minute drive to Hmongtown Marketplace for us) and so we’re yet to make it there. If you’ve been, and can compare the two, please chime in. This entry was posted in *Food, Minnesota and tagged Hmong Cuisine, Hmongtown Marketplace, Twin Cities Hmong. Bookmark the permalink. Count this former Californian as a Minnesota reader. I went to another Hmong market i guess and was seriously underwhelmed by the offerings (both food and produce) there. Guess I need to check this one out before it starts snowing for 6 months. The produce is not going to excite you at this time of year, but the food is pretty good—as long as you aren’t expecting anything more than good comfort food. Hmong Village seems to have more food vendors, but from what I can tell it also seems less Hmong-specific. The market on Johnson is well worth the extra 4-5 miles.